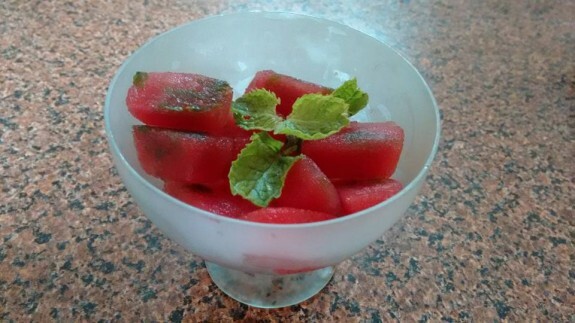 Watermelon frozen blocks with minted flavoured is really give us the feeling of temptation of frozen watermelon. Like watermelon cilantro crushed and watermelon basil leaves salad, these are the perfect small watermelon popsicles for summer refreshment. 1. Take a glass and pour the pure watermelon juice. Now add mint leaves, sugar, lemon zest and salt and stir it. 2. Pour the puree in 8 small molds or in standard ice cube trays. If you are freezing it in an ice cube tray, then you can insert pops sticks halfway through freezing. However this is optional as I did not use any stick for this. 3. Freeze it until hard. 4. Serve it immediately in an ice cream glass and garnish with mint leaves. You can use it as a popsicles with sticks too.